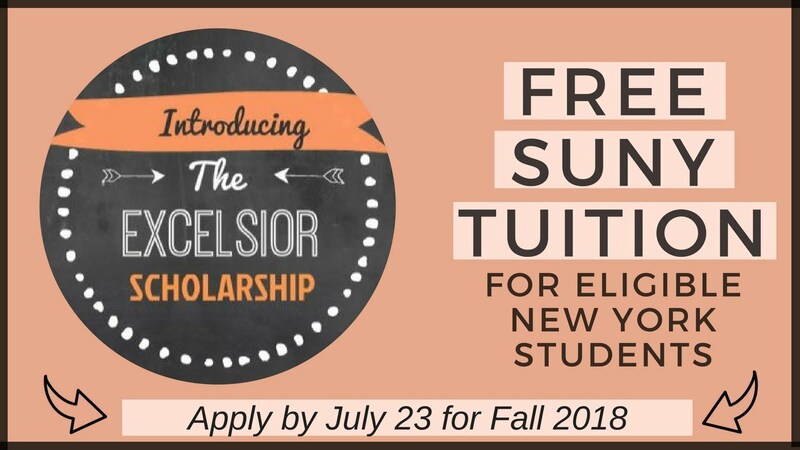 The Excelsior Scholarship Program is intended to provide up to full tuition coverage for eligible new or continuing students attending a SUNY or CUNY institution starting in the fall 2017 semester. Other grants and scholarships that cover the cost of attendance, unless the award is exclusively for non-tuition expenses. Students eligible for a full Excelsior Scholarship of $5,500 may also receive an Excelsior Tuition Credit equal to the difference between $5,500 and the remaining uncoverd annual tuition charges. The tuition charges will be frozen at the 2016-2017 annual rate of $6,470 for all Excelsior Scholarship recipients. Excelsior Scholarship payments are made in the fall and spring semesters only. Students can receive no more than two years of funding (four semester payments) for a two-year degree and four years of funding (eight semester payments) for a four-year degree. Students enrolled in an approved five-year program or in an opportunity program can receive no more than five years of funding (ten semester payments). Students who have already received a Bachelor’s Degree will not be eligible for an Excelsior Scholarship. Students with an Associate’s Degree may be eligible for an Excelsior Scholarship for a Bachelor’s Degree if all other requirements are met. be a matriculated undergraduate student in an approved program of study at a SUNY or CUNY institution. The year is based on the date the student became a matriculated student. Courses taken during a summer term can be used to meet the 30 credit requirement, but the scholarship does not provide funding for those courses. enroll in consecutive terms and years except for interruptions of study deemed permissible by the Higher Education Services Corporation (NY-HESC). Recipients of the Excelsior Scholarship must sign a contract agreeing to live in New York State for a continuous number of years equal to the duration of the awards received and, if employed during this period, to be employed in New York State. Failure to meet these requirements within six months of receipt of the final payment will convert all award funds received to a 10-year student loan without interest. The requirements may be deferred in order for the student to complete undergraduate or graduate study, including medical residency, on at least a half-time basis. Students who lose eligibility for the Excelsior Scholarship while still enrolled may count non-funded years of enrollment towards the years of required residency in the state. The amount of funds converted to a loan may be prorated based on the length of time the student complied with the requirement. Transfer Credit Requirements – to be considered for an Excelsior Scholarship, a student must have at least 30 credits per year that are accepted toward the degree program at SUNY-ESF. Advanced Placement or Other Credits Earned Prior to Matriculation – these credits may be used in any way needed to meet the credit hour requirement for a year in which the 30 credit minimum was not met. For example, a student taking only 12 credits in each semester may use 6 credits earned while in high school to meet the 30 credit requirement for that year. The credits must meet a degree requirement and can only be used in this way once. A student must still be enrolled in at least 12 credits of coursework in each of the Fall and Spring semesters. Students who have been certified with an approved disability by the College under the Americans with Disabilities Act (ADA) do not need to meet the credit hour requirements. Awards for approved students will be prorated each term based on the actual number of enrolled credits which meet a degree requirement. Students who enrolled as first-time college students in either the 2015-2016 or 2016-2017 academic year but did not complete the required number of credits in those years may be eligible to gain eligibility for the 2018-2019 academic year. 90 combined credits applicable to the degree program by the end of the 2017-2018 academic year. 60 combined credits applicable to the degree program by the end of the 2017-2018 academic year. Most recent financial aid package – this should be the 2017-2018 aid package, if available. If not available, the most recent year should be used to estimate the information. SUNY-ESF aid packages are available through the MyESF portal - http://myesf.esf.edu. 2017-2018 Student Aid Report. This is the summary document received after you filed the FAFSA. The SAR is available from the FAFSA website - http://www.fafsa.gov. changes in application data made by the student, the College, or through the verification process with HESC. SUNY-ESF is required to defer each recipient’s award amount on the College bill, but awards are not certified until the end of each term. A student who fails to meet an award requirement at the end of a term may lose the award and the amount will be owed back to SUNY-ESF. A student who fails to meet a requirement at the end of the student’s award year will lose the second term payment and the amount will be owed back to SUNY-ESF. A student enrolls in 12 credits of required coursework in the fall semester, but only successfully completes 9 of those credits. The fall semester Excelsior Scholarship would be certified, but the student would still need to have completed at least 30 credits by the end of the award year or would lose eligibility for the spring semester award. Those funds would be owed back to the College. A student has successfully completed 12 credits of required coursework in each of the fall and spring semesters, but does not complete the remaining 6 required credits by the end of the summer. The spring semester Excelsior Scholarship would not be certified and the funds would be owed back to the College. A student who loses eligibility for the Excelsior Scholarship is not able to regain that eligibility unless it is due to the total family federal adjusted gross income exceeding the maximum limit. In such cases, the student can regain eligibility in any future years in which the income is again within the maximum limit. For more information, please visit the New York State Higher Education Services Corporation website at https://www.hesc.ny.gov/excelsior/. Questions may be directed to the SUNY-ESF Office of Financial Aid at finaid@esf.edu.